A couple of college guys on a road trip were pulled over somewhere in Colorado. Thirty-eight years later, Chris is searching for a mystery trooper to repay the money he "owes." Colorado State Patrol (CSP) posted a "public service request" on Facebook this week, in hopes of figuring out the identity of a mystery trooper. 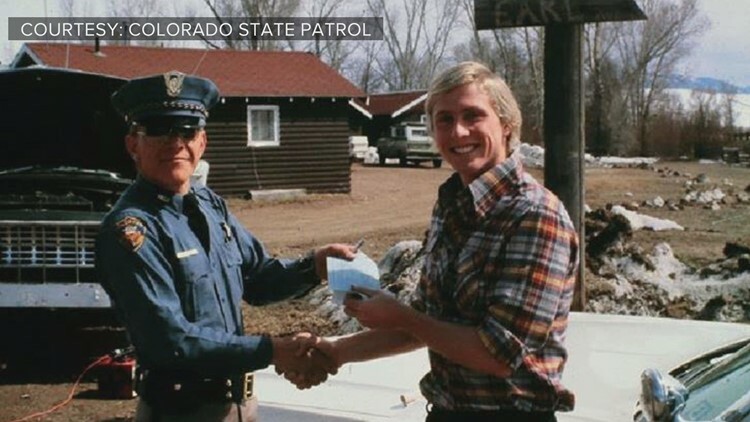 A man named Chris Butler wrote to CSP after he found a decades-old image of his buddy happily posing with the officer who just wrote him a ticket. The year was 1980. A couple of college guys were on a cross-country road trip after competing in the NCAA Swimming and Diving Championship at Harvard University. "Following the meet, we jumped at the chance to drive a teammate’s vintage Chevy Nova from Philadelphia across the Country, back to (the University of California – Los Angeles)," Butler said in his note, which CSP shared in full on the agency Facebook page. Butler's friend Dave Bartlett was behind the wheel. Somewhere in Colorado, at some time on a Friday afternoon - as Butler remembers it - a trooper stopped the car for speeding. He gave the guys two options: pay off the ticket right then and there, or spend the night in jail and wait to meet with a judge on the following Monday. They had only a check that they were en route to exchange for cash. "This was long before cash machines, cell phones and apps like Waze!" Butler said. Naturally, he and Bartlett turned the car inside-out looking for money. “We emptied (our) wallets and still short, rummaged through the glove box for any money, pulled out seat cushions and searched the trunk, which happened to be full of cases of Genesee Cream Ale, a gift from the UCLA team that we were delivering to our head coach," he said. In the end, they came up short by 5 bucks. The trooper then offered to pay out of his own pocket to save these young men from jail time. "As thanks and a show of our appreciation we promised, upon our return to Los Angeles, to forward this picture and the $5 (or whatever the difference was) but almost as soon as the film was developed the slides were lost, until... just a few days ago, 38 years later," Butler wrote. Butler said that the officer's name may have been "Richard Frank," but he is not positive. "When the internet came around I searched this name many times over the years but with no luck, always wanting to apologize for never sending the picture or returning the money," Butler said. Butler sent the photo to CSP, along with his story. Current personnel couldn't identify the trooper by the picture, so they posted it online hoping someone else knows the man. CSP had a name by Friday morning, and wouldn't you know it - Butler was right. Thanks to some crowd-sourced leads, CSP figured out that it was Patrolman Richard Frank Jr. who wrote Butler's friend a ticket all those years ago. Do you know Frank? Email us: next@9news.com.